The AVALON Hollywood team is ecstatic to announce a very special double headlining set from Andy Moor and Standerwick. Even more special, Andy Moor will be playing a set of 100% self-produced music. Together, these two represent a very interesting and very promising niche of trance music. Andy Moor is known for his involvement in past aliases Tilt, Whiteroom, Leama & Moor and more. He’s been on official remix duties for Paul Oakenfold, Brian Eno, Tiesto, Armin and more. 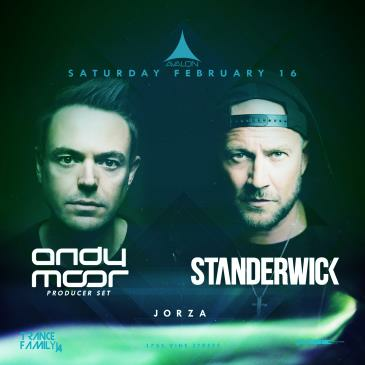 AVALON mainstay Standerwick has also gained the attention of Trance legends including Armin Van Buuren, Gareth Emery, and Markus Schulz for his singular sound. He's been featured on A State of Trance numerous times, done remixes for John O' Callaghan and has played some of the biggest festivals in the world like EDC Vegas and Tomorrowland. This is going to be a must-see for AVALON’s goers. Get your tickets now!